Wifredo Oscar de la Concepción Lam y Castilla better known as Wifredo Lam, was a Cuban artist who sought to portray and revive the enduring Afro-Cuban spirit and culture. Inspired by and in contact with some of the most renowned artists of the 20th century, Lam melded his influences and created a unique style. 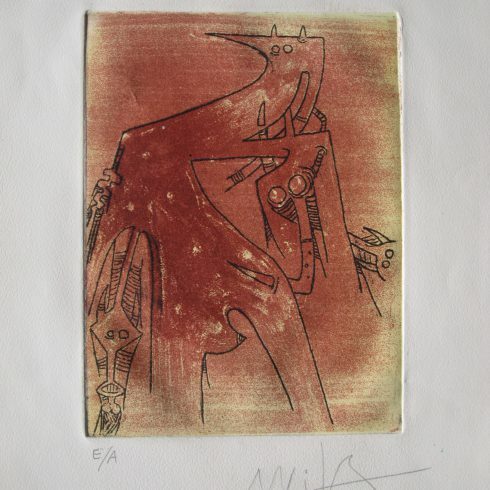 Our Fine Art Gallery has the finest quality Wifredo Lam original prints, lithographs, etchings, and aquatints. We have a large inventory available off-site and we encourage you to make an appointment to see specific works you are looking to collect. We are happy to meet you at either our art gallery showroom or at your home or office for a private presentation. Artist Wifredo Lam was born December 8, 1902, in Sagua la Grande, Cuba. Wifredo Lam’s father was a Chinese immigrant, and his mother was of African, Indian, and European descent. From and early age Wifredo Lam was exposed to rites of the African orishas, and Lam’s contact with African celebrations and spiritual practices proved to be his greatest artistic influence especially in his lithographs, etchings, aquatints, and engravings. In 1916, the Lam family moved to Havana, where Wifredo Lam attended the Escuela de Bellas Artes. During the early 1920s, Wifredo Lam exhibited at the Salon de la Asociacion de Pintores y Escultores in Havana. In 1923, Lam moved to Madrid. While living in Madrid Wifredo Lam studied at the studio of Fernando Alvarez de Sotomayor, the Director of the Museo del Prado and the teacher of artist Salvador Dali. In 1929, Wifredo Lam married Eva Piriz, who tragically died of tuberculosis two years later, as did Lam’s young son. This heartbreaking event may have contributed to the dark and brooding appearance of much of Lam’s later lithographs, etchings, and aquatints. In the early 1930s, the influences of Surrealism were evident in Lam’s work, as was the influence of artists Henri Matisse, and Pablo Picasso. Wilfredo Lam moved to Paris in 1938, where Picasso took Lam under his wing, introducing Wifredo Lam to many of the leading artists of the time, such as Fernand Leger, Henri Matisse, Georges Braque and Joan Miro. Picasso encouraged Lam’s interest in African art and primitive masks, and Lam’s involvement with Santería, a religion rooted in African culture, would become integral to his art. During that year, Wifredo Lam also traveled to Mexico, and stayed with artists Frida Kahlo and Diego Rivera. By the late 1930s, Wifredo Lam was associated with the Surrealists. 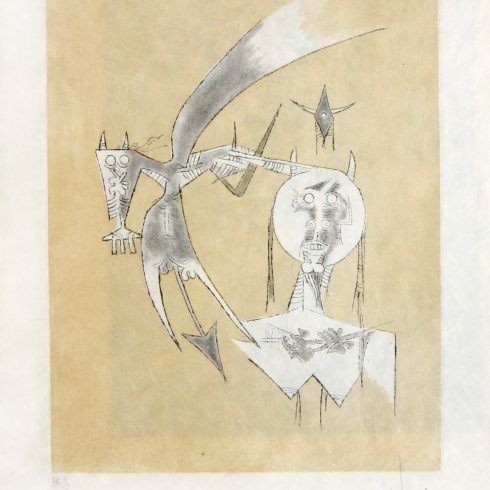 Wifredo Lam had his first solo show at the Galerie Pierre Loeb in Paris in 1939, and Lam’s work was exhibited alongside Picasso’s at the Perls Galleries in New York. 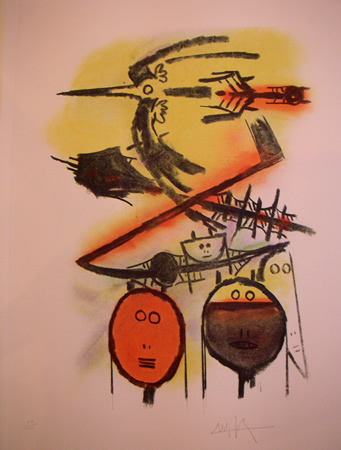 During World War II, Wifredo Lam spent most of his time in the Caribbean, along with Claude Levi-Strauss, Andre Masson, and Andre Breton, whose poem “Fata Morgana” Lam illustrated in 1940. Wifredo Lam eventually moved back to Havana in 1941. His first year in Cuba marked a pivotal point in Lam’s artistic development. In this year Wifredo Lam was introduced to the theories of Carl Jung, and by the end of 1942 Lam began The Jungle one of Lam’s most powerful masterpieces. In The Jungle Lam’s exploration of mythic images paralleled that of the Abstract Expressionists. Lam created his own style by fusing Surrealism and Cubism with the spirit and forms of the Caribbean, easily found in his graphic works. Between 1942 and 1950, Wifredo Lam exhibited regularly at the Pierre Matisse Gallery in New York. In 1946, after a four-month stay in Haiti, Lam returned to France via New York. In 1960, Lam established a studio in Albisola Mare, on the Italian coast. The winter of that year Lam married Swedish painter Lou Laurin. Lam and Laurin would have three sons together. 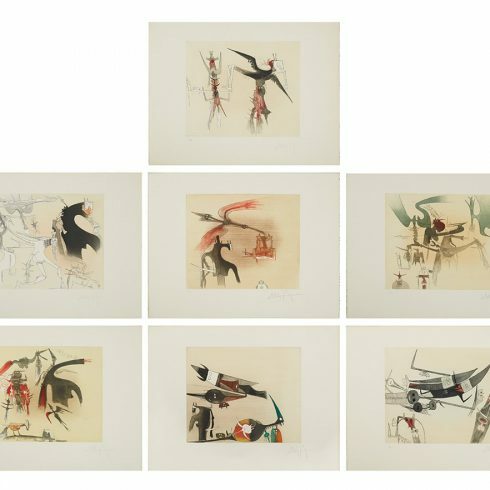 In 1964, Wifredo Lam received the Guggenheim International Award, and in 1966–67 there were multiple retrospectives of Lam’s artwork at the Kunsthalle Basel; the Kestner-Gesellschaft, Hannover; the Stedelijk Museum, Amsterdam; the Moderna Museet, Stockholm; and the Palais des Beaux-Arts, Brussels. Wifredo Lam died September 11, 1982, in Paris.